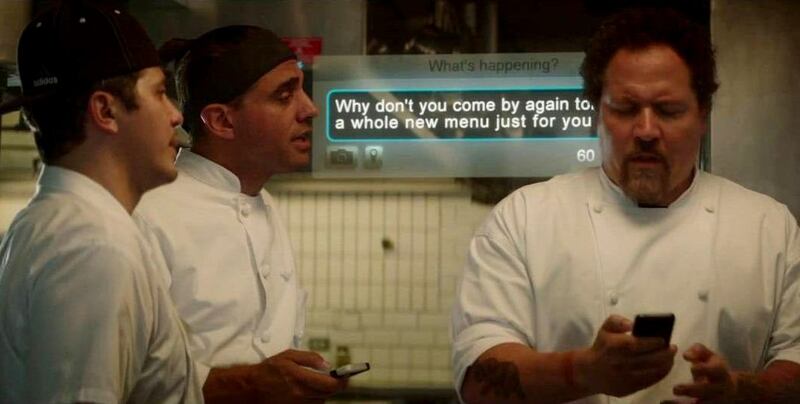 Jon Favreau directs himself in a script written by him in and as Chef. That might sound off-putting but please let that not be the reason why you do refrain from checking out this little gem of a movie that is one of the best and most innocuous feel-good movie I have come across in a long time. With a playbill that is stacked with the likes of Dustin Hoffman, Robert downey Jr., John Leguizamo, Oliver Platt, Sofia Vergara and Scarlett Johanson (no pun intended!) the movie is the story of a once-celebrated chef Carl Casper whose food inspired people one among who is a would be food critic Ramsey Michel. After 10 years in the industry Carl and Ramsey cross paths again and the result is far from palatable. What ensues is the main plot of the movie and it would be stupid of me to lay it out here in the review. Jon F, John L and Amjay Anthony who plays Carl’s son Percy go on a road trip of sorts which acts as a journey of discovery of sorts. Carl finds his mojo back cooking the food he loves and finds in Martin a trusted sidekick and a friend for life. But more importantly, during the course of this journey he finds a way to connect to his kid, a way to pass on his passion for food onto the little apprentice who ends up being the main hero of the story as it were. The movie does justice to the food it sets out to serve by highlighting the local specialties like the Miami’s little Havana’s Cuban Sandwiches, New Orleans’ Beignet and Austin Texas’ barbequed Brisket. But the movie does not limit itself to the food, the self-discovery and the coming closer of a father and son, it goes on to make a point about social media. The new beast that can make instant celebrities out of regular food-eaters, movie-goers, compulsive-shoppers by allowing them their “blogging” space but also make instant fools out of people who in a moment of madness lose control and their actions are forever on the internet to taunt them and to trivialize any other achievement they may have had outside of that moment. But through Percy we see the power of social media which also allows the same fallen hero to rise up again. Ultimately this is a movie that is not burdened by the compulsions of giving the myriad of stars their space on the reel; it is not burdened by clichés of which there are aplenty. It is a movie about a father and son taking a road trip eating their way through America and filling our hearts with a warm and gooey feeling that is not dissimilar to eating a chocolate lava cake. This is an unmissable movie especially if you have a food dream like I do. Take a bow Jon Favreau or a Michelin star if you must!